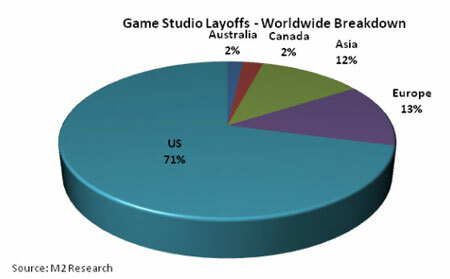 Layoffs were a huge topic in 2009 in the games industry. You couldn’t load up your favourite blog without seeing some studio close or some other company laying off people. It was a grim year, and M2 Research has summed it up quantitatively. According to their 2009 Ups and Downs article, almost 11,500 people were laid off in the games industry since 2008. The focus of these layoffs were generally QA and most occurred at the studio level. On top of that, the report states that 18 studios closed last year. Ouch! Before you go out into the streets shaking your fist at the sky and screaming out in protest to your maker, the report also states that the industry is bouncing back. A plethora of new studios are opening in the near future including Ubisoft Toronto, FunCom Montreal, Big Fish Games Vancouver & Ireland, Longtail Studios Halifax, and THQ Montreal.